Dimension Data and Cisco have helped cut rhinoceros poaching down to zero at a 62,000-hectare private game park in South Africa, and now governments and other reserves with threatened species are starting to take notice. By 2014 rhino poaching had hit critical levels in South Africa - where 85% of the global population of white and black rhino reside - with the country losing one animal roughly every eight hours. If poaching was allowed to continue at that rate all rhinos would be extinct in the country by 2025. So the two companies - a South African IT services provider and the American technology giant, who have been partners since 1991 - sat down at the Cisco partner summit to discuss if they could pool resources and expertise to help the region. The result was a goodwill IT transformation project at the park, branded Connected Conservation, which could prove to be a blueprint for anti-poaching efforts globally. Computerworld UK visited the game reserve last week to see how preparations for the second phase of the project are coming along and how it could extend its solution further throughout Africa. When Cisco engineers first went into the park to meet with rangers and security personnel they found a basic IT infrastructure, manual security processes, a brick-built security centre and very limited communication across the park. The first step, back in 2015, was to create a highly secure Reserve Area Network (RAN), install Wi-Fi hotspots and digitise the security process. Staff at the central control centre can now collect data from cameras and sensors around the 72-kilometre fence line around the park, as well as access live feeds while on patrols using rugged tablet devices. So this is the internet of things (IoT) in the traditional sense, with various sensors located throughout the park all beaming data back to a security centre, becoming the eyes and ears for a team of park wardens that couldn't possibly cover that much ground by patrols alone. Crucially, it is also not the 'Internet of Rhinos', as none of the animals are tagged or tracked, giving them a safe haven to roam. There are four gates at the park with each one housing a solar-powered local area network tower to provide Wi-Fi to all rangers in the park. The 72km of electric fence is fitted with thermal cameras, and there are also CCTV cameras and biometric scanners, all cross checked with a national database to look for known criminals and stolen vehicles, at all entry points. This data is stored within an on-premise server with a backup generator at the security centre, as well as a private cloud backup in the north of the park. The main challenge from a technology perspective is redundancy and connectivity across such a vast and challenging terrain, which is prone to floods, wind, sand and searing heat. Speed of recovery is key for the park wardens here, as any downtime is a window of opportunity for poachers. Speaking to the press last week, Dimension Data founder and group executive for the Cisco Global Alliance, Bruce 'Doc' Watson says the "most critical part of our solution is that it is proactive not reactive". Phase one was a clear success, with this real time access to data leading to a reduction of poaching by 96 percent, with no rhinos being killed on the premises in 2017. The next phase of the project will see Dimension and Cisco upgrade the network from peer-to-peer to a LoRA protocol. This long range, low power radio frequency allows smart objects to communicate at a low bit rate and over long distances. There are also plans to add sensors to vehicles, place magnetic sensors on the ground to detect weapons entering the park, and acoustic fibre to the fence line to better detect fences being cut. Fighting rhino poaching has traditionally been a military, not an IT operation, with poachers from international crime syndicates unafraid to shoot to kill. Now with better access to real time data along the fence line, response times have been cut from 30 minutes down to seven, allowing ranges to, crucially, intercept poachers instead of chase them. Endri Steyn brings 22 years of military experience to his role at head of security on the reserve. He explained that the approach to security at the park is built on four tiers: intelligence, the fence line, patrols, and armed response teams – complete with a helicopter. "So I've got my clandestine guys working on the inside, my fence perimeter, my control room, my intelligence, my helicopter and my IT and logistics," as he put it. "Collecting data is the biggest thing for us at this stage: CCTV, biometric scanning of visitors, seismic sensors in the ground, thermal imaging and drones in the sky," Steyn said. For example, his team will tag inbound vehicles so that their movements can be tracked in the park. Of course technology can't solve this problem alone. "Remember to have manpower on the ground," Steyn said. "If I don't have technology I must have more man power. I cannot have technology on its own because a camera that sees a poacher cannot arrest a poacher." It's an unfortunate fact of life on a game reserve that heavily armed poachers must be met with force. A striking statistic is that the reserve has been able to drastically reduce the number of poachers it has had to 'neutralise' in the past few years, from 32 in 2016 to none in 2017. There is also real risk of insider threats and rangers must play a constant game of cat and mouse with poachers who are well armed and well funded. 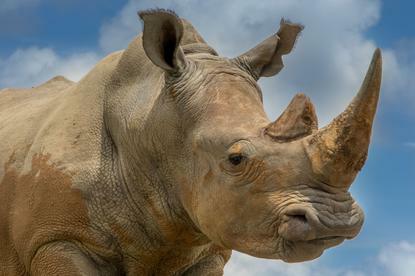 Rhino poaching is big business on both sides. The market rate for a rhino horn, which is coveted as a trophy and also for 'medicine', predominantly in China and Vietnam, could be pegged at anywhere between £60,000-£75,000 per kilogram, with the average horn weighing 5kg. A poacher will be paid around 150,000 rand (£8,750), in a country where a good salary is 30,000 rand, to shoot and steal the horn itself. For the reserve the rhino is a key pillar of the 'Big Five' (lion, leopard, rhino, elephant and African buffalo), a hunting term which has become common parlance for the most desirable animals to see on safari game drives, meaning their loss could badly impact tourism to the area, a multi-billion pound industry. Unfortunately creating a safe haven here near to Kruger has pushed the poachers elsewhere in the country, causing what Watson calls "carnage". Now this solution is garnering attention from other organisations facing a poaching threat. Connected Conservation is already expanding to Zambia, Mozambique and Kenya for elephants and rhinos. Work is in progress currently in Zambia and should be quickly followed by Mozambique. In Zambia and Mozambique the government was responsible for the request, and in Kenya it was a private reserve itself. "We are looking to expand the solution for lions and pangolins, together with elephant and rhino up into Africa, and have had requests in India for tigers and in New Zealand for sea-raised whales and sharks," Watson said. Although none of these have gone to pilot yet, it shows a growing interest in the Dimension Data and Cisco approach. Watson admits that the solution isn't perfectly replicable because of the challenge of different terrains, so they send in a team of architects who assess the infrastructure and start to develop a solution. This isn't the only project of its kind though. IBM is also turning to IoT to fight rhino poaching in the 37,000-hectare Welgevonden Game Reserve in South Africa. In a blog post on the IBM site, Francois Spruyt, chairman of Welgevonden Game Reserve wrote: "Together with our partners, we now believe that the fate of these rhinos may not rest on the presence of more guns, but on something far more powerful: data." So the slightly different approach of IBM is to combine its cloud infrastructure, IoT and predictive analytics to combat rhino poaching by placing collars with embedded sensors on typical prey-animals like zebra, wildebeest, eland and impala – not rhinos. "All eyes are focused on observing how the prey-animals respond to disturbances, including the presence of potential poachers, versus a tourist or an employee traveling across the reserve in a vehicle," Spruyt writes. "Through IBM's IoT platform, teams monitor and collect sensor-information related to location, movement pattern, direction and average speed of travel of these animals; and are using this movement and other data to create rule-based patterns, or algorithms, built on the prey-animals' response to perceived threats." The difference with Dimension Data and Cisco is how integrated the solution is. According to Dave Powrie, a warden at the park: "A lot of places also have this kind of tech but it doesn't talk to each other, what Doc and Cisco have done is make this integrated." There is unfortunately no silver bullet for fighting rhino poaching, but increased use of technology is paving the way for creating safer havens within the fence lines of private game parks. From a soft perspective there must also be a lot of work done in terms of education, especially in regions where rhino horns are still coveted. Banks must also do more to cut down on the trade, and airlines like Virgin Atlantic and Emirates SkyCargo have placed blanket bans on transporting hunting trophies. Then there is the thorny issue of funding. Private reserves often have wealthy benefactors and are run for a healthy profit, meaning they can afford high tech security. Dimension Data and Cisco covered the cost of the first Connected Conservation pilot, partly because it is a passion project to Watson and partly for the marketing value and good PR it can bring, but the companies can't keep providing services like this gratis. Watson said: "For this project Cisco and Dimension Data have funded it," and will continue to for other reserves mentioned. "Obviously it does become an issue, so we do need funding to do it," he added. The idea is clearly to prove out the Connected Conservation approach and start to package that up to sell to governments and other private reserves around the world, as well as the traditional route of approaching non-governmental organisations (NGOs) for help. But if Watson and his team of optimistic conservationists are to realise their dream, this sort of solution will have to be replicable across all parks, large and small, private and state, wealthy and poor.